About 40 million Americans suffer from sensitive teeth and another 5 million suffer from tooth avulsion annually. Although we can’t account for accidents–like that wayward bat in Little League–for the most part, both of these issues can be fixed. And because both issues are widespread, it’d benefit both you and your family to learn how to reduce tooth sensitivity and how to be proactive when a tooth’s knocked out. Putting off these issues could actually lead to a dead tooth. When you think of living structures in your body, teeth probably aren’t the first thing that come to mind. But while the outermost layer of your tooth–enamel–is made up of calcium phosphate, the majority of your tooth’s structure is made up of living cells. These living cells include the dentin–the soft, yellow tissue under the enamel–and, the pulp, which is the inner chamber of the tooth containing connective tissue, nerves, and blood vessels. These living structures are vital since they keep your tooth from becoming brittle and help you detect any pain, pressure, or temperature variations. The downside is that these living tissues can make a great playground for bad bacteria if your teeth are damaged! And once the pulp is too damaged or infection, it can die. Left untreated, a dead tooth can end up leading to infections in neighboring teeth, gums, and even the jaw bone. What are Some Dead Tooth Causes I Should Be Aware of? Obviously, deep cavities and severe trauma such as cracks or fractures are the main culprits for causing dead teeth. But you may be wondering how something as innocuous as tooth sensitivity could lead to a dead tooth. While sensitivity isn’t an immediate concern, keep in mind that continued sensitivity means that you are probably wearing down your enamel or causing gum recession. Worn-down enamel and gum recession can be caused by something as simple as brushing too hard. It can be caused by something as simple as overbleaching or clenching your teeth. The point is that everyone’s teeth wear down over time, but if you aren’t careful with certain habits, you may have a higher risk of developing a dead tooth in the future. If I Didn’t Have Any Obvious Trauma, How Will I Know the Signs of a Dead Tooth? Again, tooth sensitivity (to either hot or cold temperatures) is a great indicator that you should have your teeth checked out, since you may have microfractures in your teeth that you aren’t aware of. Sensitivity is also one of the first signs to appear, so you may avoid a dead tooth altogether by stopping this issue in its tracks; for instance, if you grind your teeth while you sleep, you can wear a mouthguard. However, if a tooth hasn’t been taken care of and is dead, then you won’t have sensitivity at all. A normal tooth would feel the cold, but since a dead tooth means that the nerves are dead and won’t respond to the sensation. Again, it’s best to see a dentist and get x-rays to confirm this. How Long Does It Take for a Tooth to Die? Again, the answer to this question is going to vary greatly. If we are still talking about developing a dead tooth from bad habits, like tooth grinding and overbrushing, it could take decades. These habits may not cause a dead tooth at all, just sensitivity. If you’ve had trauma to your tooth, then a dead tooth will occur depending on how much (and how soon) bacteria takes over. You may feel pain within a day, while others may have pain for months before the tooth starts to die. And if your tooth was completely knocked out, then blood supply can cut off in as little as 15 minutes to an hour. And even if you are able to save, the tooth and reinsert it will still require a root canal to fix the damage. If you or your child knocks out a tooth, it’s vital that you try to reinsert the tooth. If that’s not possible, keep the root of the tooth undisturbed in a container of either saliva or whole milk (both of which have an ideal chemical makeup for preserving the tooth root) and get to the dentist right away. If a tooth isn’t replanted soon enough, then your body will undergo “replacement root resorption,” where your body will reject the tooth and eat away at the tooth root. This process isn’t painful, it just means that the tooth will eventually fall out. When Would I Need a Dead Tooth Root Canal? Root canal therapy, or endodontic therapy, can help you keep your tooth even if living tissue has died. If you were able to reinsert an avulsed tooth successfully or you have enough viable enamel left to support a restoration, then root canal therapy may be a good option. You may be a little sore post-op, but as long as you follow the after-care instructions, this pain should only last a few days. However, if your bite doesn’t feel right, if your pain doesn’t go away, or you have an allergic reaction/swelling, be sure to call your dentist. When Would I Need A Dead Tooth Extraction? If you don’t have enough salvageable tooth (e.g. multiple fractures) or your root canal fails, then a dead tooth will need to be pulled. While saving a tooth is often ideal to help keep other teeth in alignment and to keep jaw bone strong, sometimes it’s actually better to have a tooth extracted. Root canals can be expensive, time consuming, and risky if your dead tooth has become brittle or you already have a severe infection. Having a dentist remove it and replace it with an appliance may be ideal for your situation. 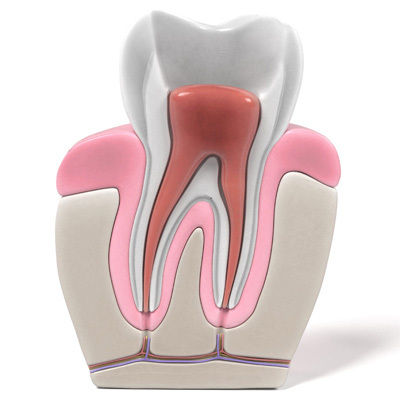 Is tooth location a key to endodontic restoration survival? What factors are responsible for the survival of a tooth treated endodontically using a titanium post and a bonded amalgam restoration? While the remaining tooth structure is the key component, what else influences survival of these teeth? A long-term evaluation of treatment using a titanium post and a bonded amalgam core restoration with a metal-ceramic crown found that the tooth location in the mouth had the most influence on survival rates, according to researchers from Spain in a study published in the Journal of the American Dental Association (February 2017, Vol. 148:2, pp. 75-80). “It can be concluded that bonding amalgam cores in endodontically treated molars results in greater survival rates than in anterior teeth,” wrote study authors Martín Caserío Valea, DDS, and Victor Alonso de la Peña, PhD, MD, DDS. Previous research has suggested that a post should be place if an endodontically treated tooth will be expected to have a load placed on it. Using titanium posts and bonded amalgam restorations to restore these teeth has shown good long-term survival results, the study authors noted. But why does this treatment succeed? What factors are key to a restoration’s long-term survival? The researchers conducted a retrospective study over a period of 18 to 22 years to evaluate restorations using a titanium post (Unimetric, Dentsply Sirona) with a bonded amalgam core and metal-ceramic crown. The impression for the crowns were made with addition-cured silicone (3M ESPE). “The most suitable material for the metal post is titanium, which causes less corrosion and is more biocompatible than magnesium or zinc,” the authors wrote . . . They found statistically significant differences in survival rates depending on tooth location, with higher survival rates for molars and the most failures in maxillary premolars. The cores in the anterior teeth were 3.26 times more likely to fail than those in the molars . . .
Read full article here . . .
You only need to skim the article to see that teeth further back in the mouth tend to have better survival rates when undergoing endodontic treatment. What About Tooth Nerve Dying Pain Relief . . . or Dead Tooth Pain Relief? Skip foods and drinks that are either very hot or very cold. Your sensitive teeth will thank you! While you’re at it, cut back on soda, citrus fruits, and other acidic foods. These will cause your teeth to ache and further damage the enamel. At bedtime, gargle with salt water and elevate your pillow. Salt water can relieve pain and clean out infection. Once you’ve gargled, be sure to rest your head on a few pillows to again, relieve some of that pressure you’re feeling. If you have the symptoms of a dead tooth or have knocked one out, you can get help at Laguna Vista Dental. We do both root canals and tooth extractions. The doctor will go over your restoration options and how to deal with post-op pain. You can easily request an appointment online, or you can call us at 916-684-3105 for more information.